What's the Great Rivers Greenway District? This article first appeared in the St. Louis Beacon. - Simply put, the Great Rivers Greenway District, referred to as the district or Great Rivers Greenway, is a publicly funded entity that oversees the planning and execution of a network of trails throughout the St. Louis region. Then again, it often seems that nothing is simple about explaining the district. Here is basic information about the funding, governance, projects and partnerships of Great Rivers Greenway. In 1999 the legislatures of Missouri and Illinois passed bills approving the creation of two recreational parks districts in the region, one in each state. In Missouri, the legislation led to the Clean Water, Safe Parks, and Community Trails Initiative that was approved as Proposition C by the voters of St. Louis, St. Louis County and St. Charles County in November 2000. Prop C levied a one tenth of 1-cent sales tax in that area, providing the Great Rivers Greenway District with an annual budget of $10 million. Last April 2, voters in St. Louis and St. Louis County approved Proposition P, known as the “Arch Tax.” The three-sixteenth os a cent sales tax will increase the budget of Great Rivers Greenway by $9.4 million a year. Note that Prop P did not pass in St. Charles County. In fact, the proposition did not make it past the St. Charles County Council and was not put to voters. That means that funds from the Arch Tax cannot be spent for projects in St. Charles County. In fact, the only money that Great Rivers Greenway may spend in the St. Charles is the portion of the initial 1/10th cent sales tax that originates in St. Charles; roughly one-third of those funds. Why? Under a policy was approved by the governing board of the district, it may only fund projects in a given jurisdiction with revenues generated by that same jurisdiction. Great Rivers Greenway’s website says its staff is “small but mighty” and its 2012 annual report listsd nine full time employees. Executive Director Susan Trautman reports to a 12-member board of directors. The board members are appointed by the executives of St. Louis County, St. Louis and St. Charles County. St. Louis County has the largest influence on the board with six appointed members. St. Louis and St. Charles County appoint three members each. Until 2011 Great Rivers Greenway was governed by a 10-person board with five appointees from St. Louis County, three from St. Louis, and only two from St. Charles County. 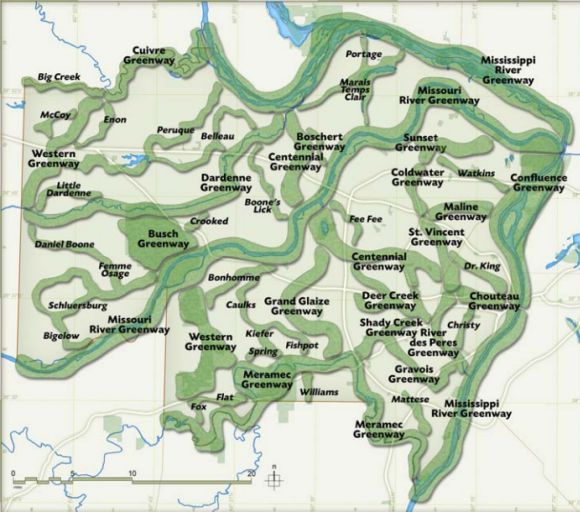 Since 2004 Great Rivers Greenway has had as its guiding vision an interconnected web of 600 miles of trails in the region made up of 45 “greenways” known as The River Ring. Currently 17 greenways are “active,” which means that 17 of the 45 greenways are in some stage of being developed. Development of a each greenway is a long process. Great Rivers Greenway does not have the power of eminent domain. Instead, after a route has been identified, the district works with a local municipality to acquire use of the land from the public or private entities that control it. Nearly every proposed greenway passes through more than one municipality, which means the completion of any greenway project requires Great Rivers Greenway to work with several public entities and purchase or acquire use of land from multiple home and landowners. Land acquisition is the most complicated as well as one of the most expensive components to greenway development, a process that can take three years from conception to bidding. The 2013 capital budget had $1,165,000 allocated for land acquisition/collaborations alone. Great Rivers Greenway has partnered on projects with many entities both formally and informally. And that sometimes leads to confusion about who is involved in what. Bike St. Louis, for example, is a project that creates signage, lanes and bike paths throughout St. Louis and St. Louis County. This project will use federal funding matched by funds independently contributed by the district and the city. The federal dollars come from East-West Gateway Council of Governments, which is given the money from the U.S. Department of Transportation by way of MoDOT. Great Rivers Greenway is perhaps most often mentioned in the same breath as Trailnet, the nonprofit that recently celebrated its 25th anniversary. This stems from the fact that for its first 12 years, Trailnet’s purpose overlapped significantly with the work of the district. In practical terms, the division of labor between the two organizations means that the publicly funded district creates and funds bike projects and greenways in the region and Trailnet focuses on community planning, policy initiatives and educational programing.